Anita had a steady start, but finished with a flourish, beating the top seed (159 ECF) with Black in the final round. She finished in joint second place on seven points out of nine, losing only one game. 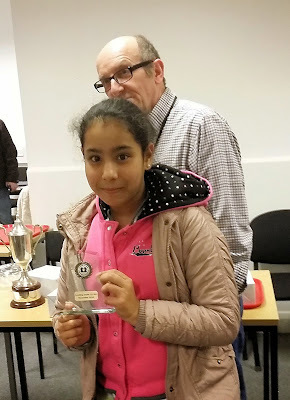 She won £90 as well as a trophy for the best performance by a girl. Her tournament performance was just short of 150. When the January grades are published, her grade is expected to increase to 142. It's worth comparing her grade to that of Nick Pert, the first Suffolk player to attain Grandmaster status. At the same age, Nick was graded 160. Anita will be able to play in the same section next year! Anita now played 39... Rd5 and White blundered with 40. gxf7+?? This brings the Black Queen into the attack. The game continued 40... Qxf7 41. Qf4 Qg6+! 42. Kh2 Qc2+! and White resigned. White will lose at least a rook and the computer shows there's a forced mate in 9.